The BPS Arts Expansion Grant Application for the 2019-2020 School Year is now live. Please scroll down for links to the RFP and other relevant documents. Boston Public Schools (BPS) Arts Expansion is a multi-year collaborative effort to expand quality arts education within Boston Public Schools by providing equitable access to arts learning experiences for all students. BPS Arts Expansion is focused on a coherent, sustainable approach to quality arts education for all Boston Public School students. This public-private partnership involves a large and coordinated network of partners, including schools, arts organizations, local and national foundations, colleges and universities, and the Mayor’s office, among others. This collaboration of local leaders along with students, families, and school staff, led by the BPS Visual and Performing Arts Department and EdVestors, believes in the power of art to develop creative, engaged learners. Improve coordination of partnerships with arts and cultural groups and higher education institutions to support high quality arts programming in the schools. 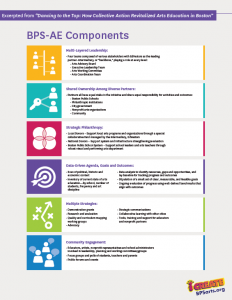 In the 2018-2019 school year, BPS Arts Expansion will be entering phase 4 of implementation, focused on expanding access to equitable arts education and deepening arts experiences while building systems to sustain a high level of arts education long into the future. 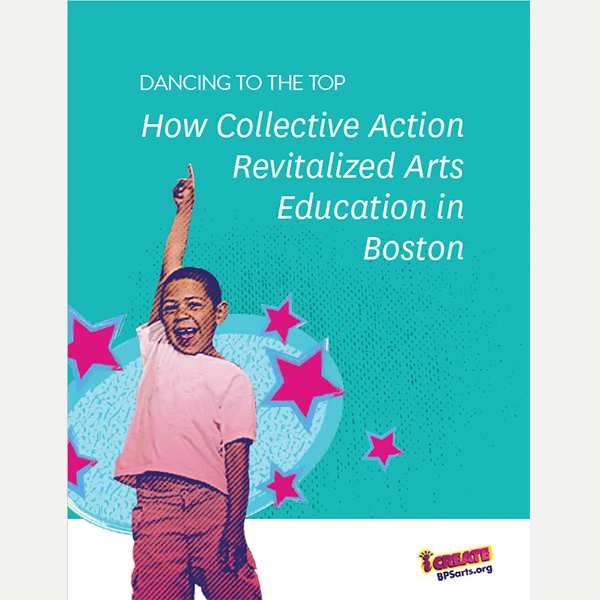 Released in May, 2016, this case study examines the multi-year, collaborative process that has made Boston a national leader in arts education. The complete report can be found here. Additionally, Dancing to the Top includes a number of resources designed to help others undertake similar work. 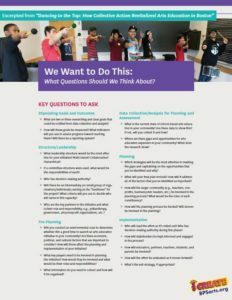 The key strategies and actions used to advance the collective effort around arts education in Boston and documented in this case study can be replicated and/or adapted to other contexts and issue areas in Boston, as well as in other cities across the country. Boston Public Schools and their community arts partners may apply to expand arts opportunities within a school or group of schools, in keeping with the goals of BPS Arts Expansion. Schools, nonprofits, and individual teaching artists are eligible to apply. BPS Arts Expansion is also offering small individual arts educator grants to support professional development or materials needed for special projects for certified arts teachers and teaching artists working in a school. The BPS Arts Expansion Grant Application deadline for the 2019-2020 School Year is March 19, 2019 at 4pm. If you have any questions, please email artsfund@edvestors.org. Click here to download the 2019-2020 BPS Arts Expansion Grant Application. Office hours: if you would like to schedule a phone meeting to discuss proposal ideas and get answers to specific questions, please click here. Information regarding the School Arts Index is available here. PreK-8 BPS Arts Inventory data available here. High School BPS Arts Inventory data available here.